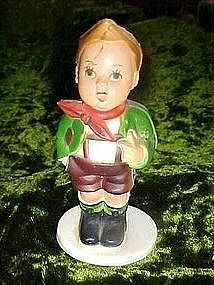 This vintage plastic figure of a Hummel look alike, is a little boy that is standing with his hands in his pockets. Measures 4 1/2" tall. Stamped, Made in Hong Kong. Hole in the top for you to use as an ornament.